Here at gleaming glass, we are proud to be one of the best window cleaning companies in Tulsa. Of course, any window cleaning company in Tulsa could say that they’re one of the best, but if they don’t explain why that is, you should probably start asking questions. Since our claim is that cleaning glass is the best window cleaning company in Tulsa, we want to back up our claim and explain why we are superior to our competition. I’d like to start out by talking about our competition. There are currently, and always will be, two types of window cleaning companies out there. On one hand you have the kind of window cleaning company who likes to clean as fast as they possibly can, and get in and out of your house in record time. This kind of company likes to charge very little, typically does not carry insurance, and they don’t take the time to do an excellent job. On the other hand, you have companies that charge a premium price for a premium service. This is the kind of window cleaning company gleaming glass identifies with. We try to schedule only one to two jobs per day, so that we are able to take our time and provide excellent service and results to every customer. We will not rush through your cleaning and in turn we won’t make a mess on your window sills or your white carpets and furniture. We’re not going to leave streaks all over the place and not care. We’re not going to be rushing to your house knocking stuff over or dripping our cleaning solution on important valuables. We’re not going to tracked mud to your house. We are just going to do an all-around superb. Here at gleaming glass, we also utilize pure water window cleaning technology. We have a hose on our truck that we unroll and hookups your tap water on the outside of your home. That tap water flows through a bunch of filters we have on our truck that include reverse osmosis, carbon filters, charcoal filters, deionization filters, and sediment filters. After the water has made it all the way to those filters it jumps out into a water tank we also have in the back of your truck. From there it is pumped through another hose that runs to a water fed Pole with a brush on the end. This brush has two nozzles that the water exits out of. Will use this brush to scrub down your windows and then rinse with pure water. The water is so pure we can just rent the window and leave it dry. It won’t leave behind any trace of having been there. No streaks, no spots, just a clean window. We can’t always you like this technology on the initial first time window cleaning, but in most cases we can. Unfortunately, the water fed pole brush is incapable of scrubbing off the debris like concrete, paint, and other construction materials. Those things will need to be scraped off. If your windows are just really dirty there’s a good chance we’ll be able to use the water fed pole for the application. When we are able to use the water fed window cleaning Pole, there’s literally no possible way we could leave behind streaks because we don’t have to use squeegees on the exterior surface of your windows. That’s one of the many ways we’re able to set ourselves apart from the competition. Another way that we set ourselves apart is our instant online estimator. You are able to get an instant estimate from wherever you are so long as you have access to the internet. There’s no longer need to call and schedule a time that works for both of us to come out and give you an on-site estimate. No more of that back and forth phone call, voicemail, email nonsense. You get the instant window cleaning estimate yourself, slept the package that works best for you, and then book the cleaning right there. We are currently working on offering a way to schedule the cleaning as well right there within the instant estimator tool that is on our website. We have been utilizing a tool called calendly to help customers schedule their own cleaning, but that required a bunch of redirecting the customer from emails. For the last couple months, you the customer would visit our website, get a window cleaning quote and select the package that works best for you, and in turn you would have received an email with a link that brought you to calendly. Once there, you would have been able to see which days we have available in the coming weeks. If you found a day that we were available to clean on in that day also work with your schedule you could click on it and that would schedule your cleaning with us. Soon, you will be able to get pricing, select the package that works best for you, and schedule the cleaning all by yourself, within five to ten minutes of starting the instant window tinting estimate process. You will be able to do all of that on one page, with one software tool. I don’t know of another window cleaning Tulsa based company who offers an amenity like this making it incredibly easy for you to get a window cleaning estimate and schedule your cleaning. As far as I know, you have to call up every other window cleaning company in Tulsa to get a quote. You’re lucky if you’re even able to get a hold of a company that will answer their phones or call you back. If you’re able to, they still have to schedule a time with you to come out and give you the estimate which isn’t a huge inconvenience for you but you still have to take the time to schedule the estimate and you’re required to be there whenever they’re there which can be a little bit inconvenient at times. Another thing that sets us apart the most is the sheer number of Google reviews we’ve accumulated over the years. In Google reviews alone, we have more 5 Star reviews than all of our competition combined. However, if you go on our website to the reviews page you’ll find almost ten times that number of three views that have been submitted to her website, Instead of Google. We are Tulsa’s most highly reviewed window cleaning company! 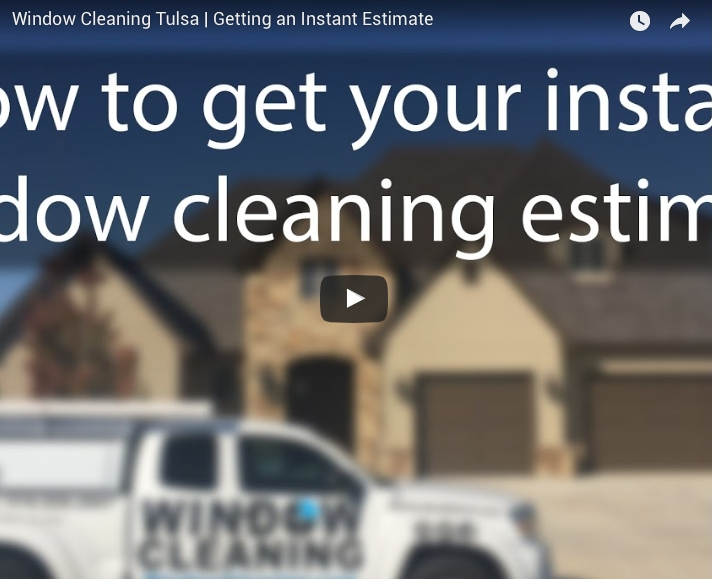 Click here: window cleaning tulsa instant estimate , to get your window cleaning estimate today!